The Islanders entered this offseason with a number of items on their to-do list seeing as it was the first year that some of the major players in the rebuild were due for contract extensions. Two weeks ago and a little more than a day after having the press conference to announce the plan for the referendum, the Islanders made a statement by re-signing Michael Grabner to a five-year deal. Today, a day after the Nassau County Legislature officially "kicked off" their seven day review process prior to voting 'yea' or 'nay' for a special election, the Islanders made news once again as they agreed to a five-year, $14 million extension with Kyle Okposo. Okposo's deal will be structured in a very similar fashion to Grabner's - an incremental increase until the final year where Okposo could be earning $4.5 million. With the way the salary cap works in the NHL though, the cap hit will be $2.8 million for all five years. That's not terrible by any stretch. The amount of years is a bit surprising, to me at least. When you have a player who is still for the most part unproven, you're always going to have the concerns in the back of your mind. 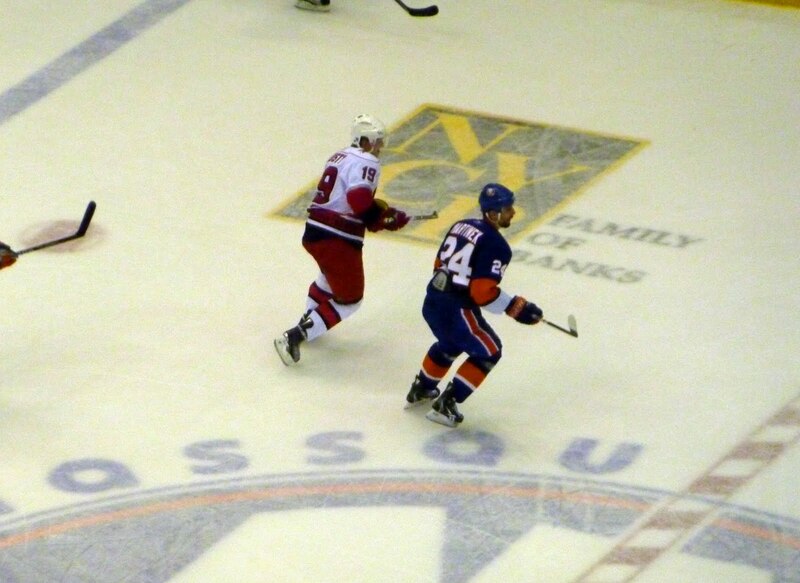 What this move was based on however is potential, and we know what we potentially have in Okposo. He already does have a 50 point season under his belt too. The RFA most likely to be signed next is Blake Comeau. For him, I would only go two, maybe three years. He had a nice season and should get a decent chunk of change for it, but I'd like to see more of a consistent effort before I commit for a longer term there. Josh Bailey is another RFA who needs to be signed, and I would think the Isles may take their time there. I don't think that they should be looking to deal him for whatever they could get, but if a deal comes up and you need to deal a young player to bring talent in, then he would be the most expendable in my eyes. The deals the Islanders are signing now, length aside, are not bad deals and won't be coming around to bite them. They know how useful both Okposo and Grabner can be, and for $2.8 and $3 million respectively, don't break the bank. It also allows the Islanders to re-sign John Tavares next summer to a deal. The one concern I do have is how much these deals take away from needing to get within the salary cap parameters. 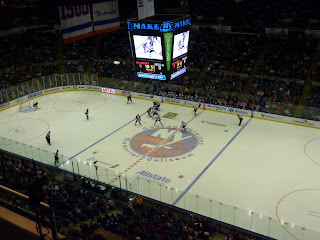 The Islanders have some solid players in the organization, but need to make a little bit of noise in the off-season to generate even more excitement and give this team a real shot. I don't want to see them blowing all of their available money in just re-signing their own players. I don't think this will be an issue with (relatively) small raises coming so far in relation to the expected jump in the cap floor and ceiling for next season. CLOSE TO PASSING THE FIRST HURDLE? One of the first milestones arrived on Tuesday as the Nassau County Legislative Board had that meeting I alluded to earlier to "kick-off" their week long discussions prior to deciding if an August 1st vote is in the cards for the referendum put forth by Charles Wang and Ed Mangano. The day started off with a rally outside of the County's Mineola offices at 8:30 AM, with many union folks in attendance holding signs and chanting. It's been estimated as many as 300-400 workers showed up for the event. Following the rally, folks assembled in the Mineola offices and did what we've come to do best: wait. The waiting would go on for quite a while, as the Republicans and Democrats started their hearing by spending the first 15 minutes arguing about which items on the agenda they would argue about first. The Democrats got their wish, and they spoke for the first four hours about redistricting, another big issue and fine mess Nassau County has unsurprisingly been able to get themselves into. When the time finally came, some folks tried to haggle over the date of the vote with opinions stating a vote on election day or even on the primary election day in September as being better options. Both of these were seemingly killed though, and we have a good shot at August 1st being the date - barring a NIFA smack down of the idea. As the meeting went on, there seemed to be a good deal of support from the legislatures. There only needs to be a slight majority in order to proceed, and it appears that will happen when the vote happens at the end of the month. It will be at that point where things will begin to get interesting as it'll suddenly become a two month sell job. Citizens need to understand what's at stake, what they are paying for in the interim and what dividends it'll pay in the long run. One of the more interesting notes to come out of the proceedings was that as part of the contract that is being negotiated, any overages of the Nassau Coliseum contsruction would be paid by Wang himself. That is rather noteworthy, and something that cannot be overlooked in this whole thing. Mangano says that the details of the plan will be available in June. The Legislators want to see something by July 1. I don't foresee any issues with that request. Mangano, Wang and all others involved however, MUST make everything clear as crystal. Don't say that the plan will be "transparent" and lie like many politicians do. You can't play games anymore - this is it. Answer all questions the first time around, and if you don't have the answer to one get it ASAP. In the meantime, as fans we can keep doing what we have been doing. Advocate for a "Yes" vote, speak to friends and relatives in Nassau. Tell folks what this means to you, especially if you are a younger person living on Long Island. Remember: this is, and always will be more than just a new arena for a hockey team. This is a transformation of an entire area to make it more attractive to tourists and those looking for places to live. DOUG WEIGHT PRESS CONFERENCE THURSDAY: Doug Weight and the Islanders have scheduled a press conference for Thursday at 11 AM, where it is expected that Weight will announce his retirement and new position in the organization. I've missed many of the events so far this summer, but will be making the trip to the Marriott for the conference. Be sure you're following our Twitter account and I will try to update early and often. Many folks seem split in thinking if Weight will be getting a front office position or a coaching job. I think for now he prefers to stay in the front office, but being one of the coaches is certainly a possibility. We'll see what it is he prefers tomorrow obviously. I think everyone can pretty much agree though that this isn't to announce he plans on continuing to play. I'm a bit late in getting the post that I wanted to out, so I've decided to write one entry that includes some other thoughts from items that happened over the weekend in the NHL. I'll start off with the re-signing of Michael Grabner. Those of you who have listened to Sean and myself over the past season may recall us saying that the best thing for the Isles to do with Grabner was to sign him to a one year deal, or even his qualifying offer. Then after that, if he proves that he is no fluke give him the long term extension. A funny thing happened recently though which changed the thought process and in turn made me 100% support what the Isles did with Grabner here. That funny thing was last week’s announcement of an August 1st referendum vote for the folks in Nassau County. In numerous spaces, it was written that Charles Wang and Garth Snow could help the future of the team out by investing in it now in order to try and make a statement. This could have been either by re-signing your own players or by bringing in some notable players from the outside. The Islanders didn't give Grabner his five year, $15 million extension just for the hell of it though. They strategically chose him in order to make the statement on how committed they are to keeping this team here. Grabner now becomes the only Islander with a contract that extends beyond the current lease (Rick DiPietro is the other). Even if it only extends for one year beyond, it still makes a point. Getting Grabner at $3 million a season now is actually a fantastic investment because the odds are heavily in his favor that this season was indeed no fluke. As a young lad waiting to be picked in the top part of the first round in 2006, many compared his goal scoring prowess to that of a Mike Bossy. I usually hate when players are compared to Hall of Famers that they have no business of even being in the same sentence as, but in order for scouts to be able to say something as incredulous as that you have to be pretty darn talented. If Grabner repeated or even exceeded what he did this year and had to be re-signed next year, there is no chance you're getting him at $3 million. Good job by Snow and Wang to react quickly to the news about the vote and follow it up with the re-signing of a huge fan favorite - but one whom also happens to be really good at hockey. R.I.P. Derek Boogaard: As a diehard fan of not only the Islanders, but the NHL in general I was shaken by the loss of New York Rangers forward Derek Boogaard over the weekend. 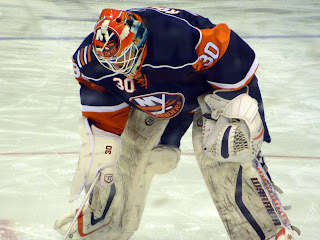 Boogaard was a guy I really liked, and last offseason really hopped the Islanders would take a good long look at. He would ultimately sign with the Rangers (for a deal we both bashed at the time, I might add) but beyond that he was a player who had my respect. I go back in time when Boogaard first came up. I have also been a fan of the fights, so naturally Boogaard was a guy I enjoyed watching be it live or on YouTube. It's always going to be tragic no matter the cause of death when you're looking at someone who was 28. But unfortunately, it appears that there’s a decent shot that cause of death may make it all the more heartbreaking. Reports indicate that Boogaard recently checked into the NHL's substance abuse program. Boogaard had only played 22 games this year after suffering a bad injury after a fight with Matt Carkner of the Ottawa Senators that left him with a bum shoulder and a severe concussion. Boogaard was in the process of coming back, and had been skating but was a bit out of shape from all of the inactivity. The Rangers had sent him home to Minneapolis to work on his conditioning less than a month ago. Let's hope this story doesn't get any more tragic than it has to. We send our condolences to the family of a man we respected and always hoped would end up playing for the good guys. He is now for sure in heaven. Random Playoff Thoughts: While watching the first couple of games of the Eastern and Western Finals, a cool thought popped in my head. 1) How nice would it be to see a Lightning vs. Sharks Stanley Cup Finals? Both teams hooked up for a big trade a couple of years ago when Dan Boyle was sent out to California, and the Lightning are having their success without having the main pieces they got in the deal directly contributing for them. Those key pieces were moved for others that have come up in a big way, however. Matt Carle was traded in a deal that brought Steve Downie to Tampa, while Ty Wishart was sent to the Isles for Dwayne Roloson. Funny how some of those deals work out just a few years down the road, isn't it? 2) With the way the East and West finals are set up in the NHL and NBA, it's possible the winning teams from each sport could be named the Lightning and the Thunder. For Whom the Dice Rolls? Throughout the entire season, even dating back as far as two seasons ago, I had made it abundantly clear that I was going to do my best to ignore and not comment anymore on the 800 pound gorilla in the room - the arena situation. Unfortunately, as we get dangerously close to the 11th hour it is obvious that I can no longer ignore this situation. Naturally, something happens that sort of forces my hand a bit. That's exactly what today's news is going to do. A "major" announcement is planned for 11 AM Wednesday. When I originally started putting together this post on Monday night, it was just supposed to be talk about the possibility of a deal with the Shinnecock Indian Nation. I didn't expect news relating to this situation to evolve as much as it did over the past 24 hours, but here we are. By now, you most certainly have heard about Nassau County Executive Ed Mangano's scheduled press conference Wednesday morning at the Nassau Coliseum. Tomorrow at Nassau Coliseum, I will announce a major economic development & job creation plan for a sports-entertainment center and casino. One of the things that's bothered me all day is the use of the word "plan." I'm obviously awaiting this announcement tomorrow, but just keep in mind that it could just quite simply mean "here's another idea for how to develop the land." - Shortly after releasing his statement, the Islanders echoed what Mangano announced in a press release of their own. - After a whole day of speculation, the Isles confirm on their splash page that Mangano, Owner Charles Wang and Town of Hempstead Supervisor Kate Murray will all be in attendance. - Other attendees include various Isles employees, no matter the department and some available players (Michael Grabner confirmed on his Twitter account that he will be in attendance). - Since this is a public hearing, anyone can attend. But the Isles have taken this to the next step as season ticket representatives have called their holders to invite them, with some telling their clients that the plan is for "construction on a BRAND NEW arena to begin in June 2012 with expected completion by the 2015-2016 season." - We also know that the Shinnecocks are somehow involved given that this is a joint announcement, with a casino possibly being constructed in Uniondale, Belmont or elsewhere on the Island, presumably in Nassau County. When Mangano recently had his State of the Union address to the residents, he talked about a joint project with the Shinnecocks, and even threw out the amount of $400 million of public money to get things going. It seems very unlikely that something of that magnitude would get passed in this economic climate, in a county that is now controlled by the state - especially after a proposed project from Wang's side had most of $3 billion covered by private funds before it was shot down. The fact that Mangano, Wang and Murray are all going to be together at the same event is the real kicker though. That is essentially cats and dogs living together. When everyone gets together like that, the potential for the photo ops increase where everyone can suddenly puff out their chests and say "see, I got something done!" I think what the season ticket reps are telling the holders is interesting, and only that for the time being. It would appear to me that they are being optimistic about this "plan" going through what it needs to go through and that is presumably the earliest start date and the target date that everyone else has in their minds. The real fear that I have is that since this sounds like whatever this is will be going to a vote on August 1st (as reported by B.D. Gallof and Chris Botta), that some of the folks in Nassau will put up a big fight. I don't say that to offend anyone who reads this who is in Nassau, but if you've followed this story long enough you are well aware by now of how some folks in certain towns have this vision that they live in some sort of a Utopian society, where building up means you are becoming too much like the city. I'm not convinced that a public vote gets us very far. Call me a pessimist, but I think at this point I've been beaten down by this too much just as many of you have been. It seems we've been pelted with rocks from all angles from the past 10 years on the arena issue. By the way, I find it strangely ironic that on the same day when the future of the Phoenix Coyotes is up for a vote, Nassau County announces this big shindig at the Coliseum. This could turn out to be a huge two days for the NHL and two of their franchises in question. In a span of just a few weeks, the attention can turn to just three teams in question in the Atlanta Thrashers, Florida Panthers and Dallas Stars. The logical part of me feels that what is widely speculated by fans across various message boards is what will happen. The announcement is a joint one with a casino going up in Belmont, with the tribe paying money to Nassau for the land. Then that money, and the tax on it will then be used to try and fund the new Coliseum, which ultimately won't be $400 million but less (the original number was put out there by Mangano for "sticker shock" effect). The other wild card in this? Charles Wang. You would have to assume he'd be on board here, or why even bother showing up, right? We'll, we've heard and seen stranger from our owner, and without knowing what square we're on as of tonight we don't know what hurdles have to be climbed if any. None of us know what to expect tomorrow, but most of the hockey world is waiting with baited breath now for this announcement at 11 AM. Some of the major outlets like TSN and Hockey Night in Canada have picked up on the Mangano statement and are now following what's going on. Just remember to keep a level head everyone. It's good to get excited, and at the very least we should definitely see the ball begin to roll fast and furiously after this announcement. There really is no more choice anymore on the speed that ball rolls. This is the beginning of the end. We'll find out in due time if it's good or bad. Have a good night everyone. Rest up. Here's hoping that my pessimisim is unfounded. While the Islanders may not have been able to participate in this year's playoffs, they certainly have been a treat to watch for the hockey fan in general. I'm trying to think in my lifetime when I have seen a playoff season this crazy and I really can't think of one. The overtime games, the underdogs winning - it's all been really fun to watch. When I think of what the biggest story has been thus far, I think you have to look at what the Tampa Bay Lightning are doing. Not only did they oust a Penguins team that was still very strong without Sidney Crosby and Evgeni Malkin, but they also quickly dispatched of a Washington Capitals team that up until this point had looked the best of any Caps team I've seen in the playoffs in recent years. The Lightning are getting top notch performances from Martin St. Louis, Dwayne Roloson and...Sean Bergenheim?! As strange as it may be to say that, it's not uncommon for solid role players to elevate their game in the playoffs. Bergenheim has always been a very solid role player, and I'm glad to see him having the kind of success he is so far in the playoffs. Some fans may be biter about his departure from the Island, but the reality of the situation is that it just wasn't working out here, and it wasn't going to. Bergenheim was at the age where you could no longer consider him "the future." That point had come and gone, and when it did Bergenheim was at a crossroads. With many similar players on the roster, Garth Snow had to make a tough decision. Bergenheim was essentially redundant, and cutting him loose gave the Isles the ability to bring in guys like P.A. Parenteau and give him a chance, along with guys like Matt Martin and Michael Grabner. At any rate, it's good to see him, along with Nate Thompson play well as solid role players on a strong team. Fans from Minny, Edmonton and LI are unsurprised by Roli. ﻿Meanwhile, fans in Minnesota, Edmonton and Long Island are unsurprised at the way that Roloson has played, carrying the Lightning on a couple of nights too. We knew dating back to his days as an Oiler that he can come up big in the post season, but he remained one of the most underrated goalies in the league. When he became one of the top available goalies on the market, many questioned why a team would want him because of his age. Sure, that has to be a concern, but when it comes to his play I think anyone who had watched him closely enough would know he had plenty left in the tank. Steve Yzerman watched closely, and when it came to giving up a B-level prospect for him in Ty Wishart when other teams balked, he went ahead with the move. Now, he looks like a genius. Obviously, if it's not clear by now I am pulling for the Lightning to get all the way to the finals. Ideally, it would be nice to see Roli finally add a cup to his resume. He's putting to rest a lot of the talk of age. Other story lines include the lack of intensity from teams that are fighting for their lives. In their respective game fours, both the Philadelphia Flyers and Washington Capitals looked like they would rather be doing something else. Unless that something else was golf, I can't fathom why neither team really showed up. In that final game for Washington, Alex Ovechkin played well and looked good. Unfortunately for him, the list ends there. While he didn't score in last seasons upset to the Montreal Canadiens, you can't say that Alex Semin didn't try. When you pelt 48 shots at a red hot goaltender, even if he stops them all you did your part. But I can't say I feel the same way about Semin in the 2nd round. He's a very talented player who perhaps got away from the things that make him successful. The Flyers on the other hand finally hit a brick wall when it came to their goaltender by committee. Going for relievers works well in baseball, and it worked well for the Flyers in the 1st round. But no matter who they had in net against the Bruins, it didn't change the way they played. Of course, it didn't help that the Flyers were missing Chris Pronger and had Jeff Carter at anything but 100%, but they are still a strong team up front and on defense. Goaltending continues to be an issue here, and it will be interesting to see how they solve this problem. Do they continue on with Sergei Bobrovski after giving up on him quickly? Do they try and find a way to sign Tomas Vokoun, even if it means shedding some salary? Or, do they give a call to a team for a cheaper but unknown options, such as the Isles very own Evgeni Nabokov (more on this in a later post)? One of the other cool stories so far is the rise of the Nashville Predators. This is something I'll comment on more in a few days or so, but I am enjoying the success they are finally having. The team and their fans deserve it. ISLES IN THE WC: The Islanders sent six players to the World Championships: John Tavares (Canada), Al Montoya (United States), Evgeni Nabokov (Russia), Milan Jurcina (Slovakia), Radek Martinek (Czech Republic) and Jesse Joensuu (Finland). So far, Montoya has looked pretty good playing for former Isles coach Scott Gordon. Montoya did have one bad start and was ultimately replaced as the starter by Ty Conklin. In general, goalies are changed quite frequently after a bad game when it comes to tournaments like this. Montoya did have a relief appearance though on Monday, and played well again. It remains to be seen if he took back the starting spot from Conklin though. Meanwhile Tavares has been one of Canada's best players. As TSN pointed out in an article on Sunday, Tavares had four goals and eight points while only averaging 13 minutes of ice time. In Canada's 3-2 win over Sweden on Monday, Tavares added another goal to bring his total to five. I know a lot of fans were uneasy with Tavares going to represent his country, especially after the injury that he suffered last season. From my perspective though, it's definitely beneficial for a player like him. At that age, you want him playing as many games as possible. Since the Isles can't be a part of the dance this year, it's only natural to think that the next best thing is to play in some meaningful games to your country. While they may not be as important as the Olympic games, they certainly have a lot of weight up North especially for the non-Vancouver Canuck fans right now. Now, on the other hand a player in Martinek's position should not be participating in games like this. Radek has always taken great pride in playing for two teams, however: the Islanders and his National team. I wasn't surprised Martinek decided to go, but raied an eyebrow when I took into consideration his contract status (UFA to be), his injury history and his desire to be re-signed by the Islanders. Here's the conundrum now, however. Martinek sustained a nasty injury in the tournament, which ended his participation for the summer. His injuries are not as bad as originally feared, but still sizeable (concussion, but with no spinal injuries). Martinek hasn't been the poster boy for durability, and neither has the Isles defense. Mark Eaton, Mike Mottau, Andrew MacDonald, Milan Jurcina and Mark Streit all sustained prolonged and season-ending injuries at some point last season, which obviously raises some red flags. Then you take into account that Martinek's injury history (excluding this past season, which we'll say is an outlier for now) isn't the cleanest, and I'm having a hard time convincing myself that the Isles have to keep him. Martinek's decade on LI has been mired by injury. ﻿﻿Martinek is an excellent and very underrated defenseman, but does that mean the Isles should pay the price and possibly be scrambling for defensemen again next season? I think it's become quite clear that even this improved defense corps (from what it was in 2009-10) needs to be improved once more to add in durability. When the Isles resigned Milan Jurcina, both Sean and I were happy about it. Not everyone was, and we had some good discussions about it on Twitter and Facebook. Truth be told, Jurcina is very injury prone himself. However, when he played and was used in the right situations he excelled and that's why I have no probelms with him coming back. When he was re-signed, I was under the impression that Martinek wasn't returning anyway. Defense has become the number one issue facing this team right now in my opinion. It still could use a slight overhaul to add durability. If that means letting a very good defenseman go in Martinek, then so be it. PLAYOFFS IN JUNIORS: Some of the Isles younger players are benefitting from some great play in the playoffs for their juniors teams too. The most notable of the bunch is Nino Niederreiter, who is just tearing the WHL up in the playoffs with nine goals and 16 assists for 25 points over 18 games. His team is in the finals against Kootenay, who won the last game in a wild one 7-5. The series is tied 1-1. But for Isles fans, the story is Niederreiter and what he's done. When you consider the slow start he got off to when originally going back down to the WHL, it is all the more impressive. I would be shocked if he didn't make the team next season - or, at the very least wasn't given a very long leash and every chance to grab one of the final spots on the roster (barring any unforseen changes upfront). The experience is the reason why it was necessary for Niederreiter to go back down, and why it would have been as equally as beneficial if the Isles did right by Josh Bailey a few seasons ago. Hopefully Niederreiter's team can continue to streak through and make the Memorial Cup. Casey Cizikas is also going deep into the playoffs as a member of Missagua in the OHL. Cizikas and his Majors are also in a dog fight with the seris tied 2-2 after a tough overtime loss on Sunday. Cizikas has five goals and 10 helpers for 15 points in 13 games. For the OHL, those are very solid numbers. For Cizikas, each day he seems to add another chapter to a story that seemed very unlikely at one time. As an Isles fan, you have to be thrilled seeing these two young forwards going deep into their playoffs. We have seen the past few years what Calvin deHaan was all about, as well as fellow defensemen Travis Hamonic and Matt Donovan. Hamonic of course is already up with the Isles, and deHaan had a solid year as the captain for the Oshawa Generals. The forward picture was a bit more murky as we wondered what the ceiling was for guys like Niederreiter, Cizikas and others such as Kirill Kabanov. All three had solid showings in the post season, although each seemed to take a different route to get there. We want to have these battles in the future, even if it means making a tough decision to get better elsewhere in the organization. OTHER NOTES: Obviously, both Sean and I have taken some time off to take care of some items we may have put aside. Those of you who have continued to follow us have most likely seen the Twitter and Facebook updates we've had throughout these fantastic playoffs thus far. I've taken some time to think about what I'd like to write about as we enter some of the slower months and I have some good ideas kicking around in my head that I plan to have some conversations with the Isles on. Once I figure out what I'm able to do you guys will have a better idea. In the meantime, feel free to continue to follow us on Twitter and Facebook, and feel free to tell us what your favorite moments have been so far of the playoffs. As always, we continue to welcome all thoughts and questions, be it on the NHL or the Isles. One last thing, don't be surprised if some things change on the blog here and there. I know over the winter I said I was going to change the format up, and I held off because I needed to learn some of the bells and whistles and by the time I got to think about what I wanted to do, there wasn't much left to the season so I put any renovations off until the offseason. So if you pop on one day and we're down, down fret and just sit tight. I promise it won't be three weeks before my next post.